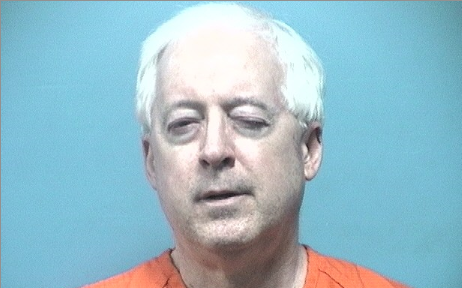 Roger Shuler’s mugshot shows us what Rob Riley has in store for any blogger who writes about him in the future, natch? This aggression cannot stand. Please support our Rally.org fundraiser for the Shulers’ legal defense fund. Roger Shuler, the Birmingham-area blogger known as Legal Schnauzer, was beaten and arrested one week ago today by Shelby County Sheriff’s deputies. They were acting on a warrant for failure to appear before a special, secret kangaroo court appointed by Judge Roy Moore of Ten Commandments infamy at the behest of Rob Riley. These blatantly unconstitutional proceedings are exactly the sort of shenanigans that Roger has fearlessly reported for years even as they have quietly become the “new normal” in Alabama justice. Now being held without bond or representation, Shuler is being made into an example to discourage other Alabama bloggers from reporting on powerful Republican interests in our one-party state. This is a chilling assault on the First Amendment, due process, and the entire body of Supreme Court precedent about prior restraint. It is fascism come to Alabama wrapped in a flag and carrying a cross, but you can do something about it. Support our Rally.org fundraiser and take a stand against this travesty! Later today, I will be visiting Mrs. Shuler in the home where she is currently barricaded for fear of the law enforcement officers who are supposed to protect her. The scene in the garage, where deputies piled onto Mr. Shuler — and then charged him with resisting arrest without ever actually saying “you are under arrest” — has not been touched, so I will be taking video. Mrs. Shuler is low on supplies because deputies have been beating on the Shulers’ door for weeks now attempting to serve both of them, so I will be delivering a few items that she needs. I will do everything I can, but we need your help to do more. Please help by tweeting, posting, and sharing our Rally.org fundraiser for Roger Shuler’s legal defense. Together, we are more powerful than even Karl Rove! Please contribute to our Rally.org fundraiser for Roger Shuler’s legal defense and help him fight this battle. Our freedom depends on it! welcome to China. Limbaugh would be arrested in Alabama too. Was nice to see real pic of Carol-knew she was a hottie! :-D Best wishes, to both of you-hope thisends well, and SOON! Now are you going to give this to Carol his wife? You can go to Legal Schnauzer’s blog and donate and it does directly to her and she can pay the legal fees. It is scary to pay to folks that we know nothing about because all catastrophe’s and such folks come out of the woodwork in scams. NOT SAYING YOU ARE DOING THIS but I would think people would want to donate to Shuler’s directly. No one is telling you not to donate directly to Carol Shuler via PayPal. We set this up separately, and all funds will go directly to Mr. Shuler’s defense.